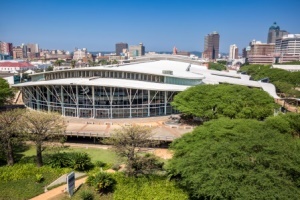 The Durban International Convention Centre (Durban ICC) will host several major international conferences this year, drawing over 20 000 delegates to the City of Durban and KwaZulu-Natal. Durban ICC Chief Executive Officer Lindiwe Rakharebe said the Meetings, Incentives, Conferences and Events industry is an important component to the South African tourism industry and vital to the country’s economic development as it contributes to a wide variety of sectors. “For every individual attending a conference or exhibition at the Durban ICC, either as an exhibitor, delegate or visitor, there are positive economic spin-offs for local businesses,” she said. Rakharebe said the Durban ICC, as a trailblazer in attracting local and international events to the country, has a mandate to be a catalyst for economic development and job creation in the City and province. “Despite an increasingly competitive marketplace both locally and globally, the Durban ICC contributed R4.7 billion to the country’s Gross Domestic Product in the 2017/18 financial year. Furthermore, 9 474 jobs were created as a result of the Durban ICC’s activities over the past financial year,” said Rakharebe. The centre is a versatile venue of enormous dimensions, flexible enough to meet any need, no matter how extraordinary. International conventions, exhibitions, sporting events, concerts and special occasions of every kind can be accommodated. Flexibility and versatility are key factors in the design of this state-of-the-art, technology-driven centre. The complex incorporates the Durban International Convention Centre, the Durban ICC Arena and the Durban Exhibition Centre, offering over 112,000m² of flexile event space, making it the largest flat floor, column-free multi-purpose event space in Africa. “However, the Durban ICC is more than simply a venue. It is a platform for meetings, a facilitator of dialogue and a place for people to connect, debate and ultimately find common ground. From the moment the guest sets foot into our venue, the Centre strives to deliver its unique brand of world-class service and a uniquely warm, African experience,” said Rakharebe. The number of events held at the Durban ICC in the 2017/18 financial year were over 450, with a total of 1 387 595 delegate and visitor days generated by the Centre in the same financial year. “This is an increase of 2.5% compared to the previous year where there were 1 353 410 delegate and visitor days generated by the Durban ICC. The hosting of more exhibitions, trade shows, trade fairs and increased average size of events are the main reasons for this increase. The Durban ICC had an approved business plan that focuses on key strategic objectives of the business which includes business development and cost containment. This plan will enable us to ensure continued sustainability and profitability,” Rakharebe added. • Africa’s Travel Indaba 2019, May 6-9, about 10 000 delegates. • 9th SA Aids Conference 2019, June 11-14, about 5000 delegates. • 22nd National Association of Child Care Workers Biennial Conference, July 2-4, about 1500 delegates. • Annual Meeting of the International Society of Electrochemistry, August 5-9, about 1000 delegates. • Africa Bio Convention 2019 August 25-28, about 2000 delegates. • World Conference on Drowning Prevention 2019, October 7-10, 500 delegates. • UCLG Conference & Exhibition, November 19-22, about 3000 delegates. As Africa’s leading convention centre – the Durban ICC has been voted “Africa’s leading Meetings and Conference Centre” at the World Travel Awards no fewer than 17 times in 18 years – and the recipient of many other awards. Rakharebe said the Durban ICC is a driving force of the city itself, clearly in line with the developmental agenda of the national and local government. Hosting major events and conferences requires extensive planning from the sales stage when a booking enquiry is made to the event co-ordination stage until the event goes live. “The Durban ICC has a highly experienced and diverse team having hosted both the largest (International AIDS Conference 2016) and second-largest (COP-17 in 2011) conferences ever held on the African continent,” she said.